The USS Hornet Sea, Air and Space Museum, in honor and remembrance of Pearl Harbor, will be hosting a special panel discussion with the four-time Purple Heart recipient Lawson Sakai, who will reflect upon his memories of December 7, 1941. This event will occur on the USS Hornet on December 7, 20918 beginning at 11 a.m.
Lawson Sakai is a four-time Purple Heart recipient and member of the historical 442nd Regimental Combat Team. Formed in 1943, the 442nd was a segregated unit made up mostly of Nisei (second generation Japanese American) soldiers. With its �Go for Broke� motto, and despite lingering prejudice against Japanese Americans, especially in combat roles, the 442nd became one of the most formidable and well-respected fighting units in the U.S. Army. By the war�s end, the 442nd had become the most decorated unit for its size and length of service in Army history. The 442nd was awarded nearly 9,500 Purple Hearts, eight Presidential Unit Citations (including five in one month) and 21 members were awarded the Medal of Honor. Wahine U�I, an Alameda-based dance company, will greet guests with the Aloha spirit as they dance traditional hula. 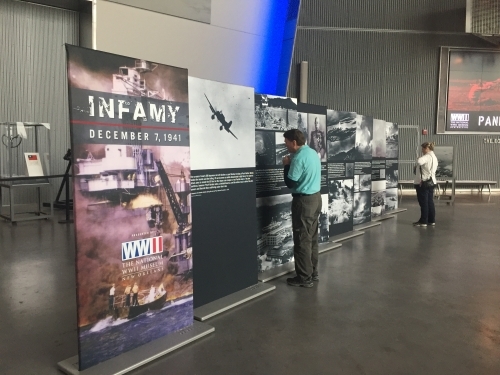 The Museum will also unveil a new special exhibit called �Infamy: December 7, 1941.� Produced by The National WWII Museum, the exhibit will explore the events that followed Japan�s surprise attack on Pearl Harbor, which ultimately led to America�s entry into World War II. Following the attack, communities across the country united behind the war effort, performing diverse tasks to help the Allies, no matter how large or small. The Sunday morning attack at Pearl Harbor marked one of the darkest days in US history � with President Franklin D. Roosevelt declaring that December 7, 1941 �is a date which will live in infamy.� Taking off from a fleet of Japanese aircraft carriers, waves of bombers unleashed a surprise attack on the US Naval fleet in Oahu, Hawaii, killing more than 2,300 Americans. A day later, the nation declared war on Japan. For more information on this and future events at the USS Hornet please phone (510) 521-8448 or visit www.uss-hornet.org. Photo caption: The National WWII Museum�s �Infamy: December 7, 1941� exhibit recounts the strike in Hawaii as well as the lesser-known but nearly simultaneous attacks on American territories in the Pacific, including Wake Islands, Guam and Philippines. Exhibit displays � featuring powerful images and personal stories taken from oral histories of witnesses � convey the losses, disrupted lives and reactions of military service members and ordinary Americans as they realized they were now at war.